Many of us men find it challenging to juggle competing areas of responsibility and to maintain balance in our lives. Beneath the surface we have nagging doubts about our self-esteem, our effectiveness, and the meaning of our lives. Plus, it’s hard trying to deal with all of it on our own. If this describes you, then come join us for our Neighborhood men’s retreat. In large group discussions, small group breakouts, & personal time with God, we’ll address some of these issues. At the same time, our schedule will be relaxed, with lots of food & fun. 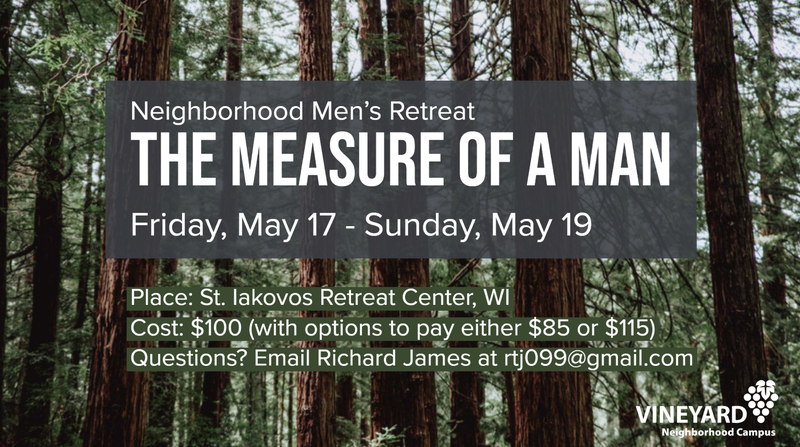 This retreat is a great opportunity to bond with other men & to grow closer to God. For more information, email Richard James. What special dietary needs should we consider as we plan for the meals at the Measure of a Man 2018 retreat? Are you willing to drive your vehicle and provide transportation for other guys? If Yes, how many guys will your vehicle hold including yourself? What is the earliest time you can meet to leave on Friday?